Figuring out the cost of a video transfer is quite simple...if you only have one tape. If you are dealing with multiple formats, different lengths and additional titling, it may get a bit more complicated. The price list below will be a great tool to get a pretty good idea of the cost your project will incur. If you require any further manipulation of your footage such as graphics, background music or professional or self-service editing, ARIZONA MEDIA SERVICE can help you too! Different goals may require different processing approaches of your footage and may involve more time or further manipulation of your footage and may require the transfer to a flash drive to be used in a non-linear editing system. Whatever the task may be...call 480-495-6583 and talk to us - AMS is always here to help! 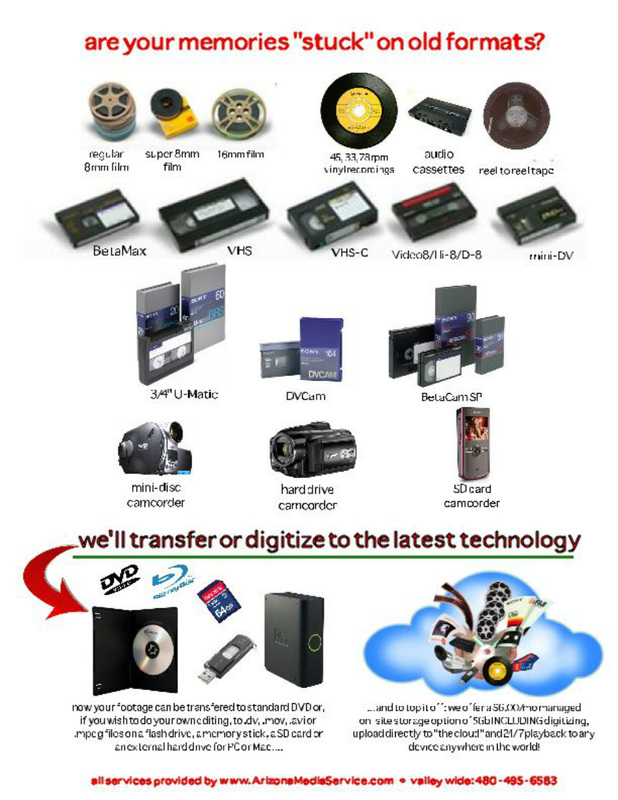 If you request transfers/conversions to an editable format on a SD card or supply your own flash or hard drive, please note that you will have to have the appropriate computer software to import and edit the delivered video standard or video codec called MPEG-4 for Macintosh and Xvid for Windows PC.